Garage door maintenance serves to keep all the parts of your garage door working together in concert. Without professional attention, opener motors can fill up with dust and debris, cables and chains can become dangerously loose, and doors can fall out of alignment. These and other garage door issues can be quite annoying, especially if they cause your garage door to fail when you’re in a rush. 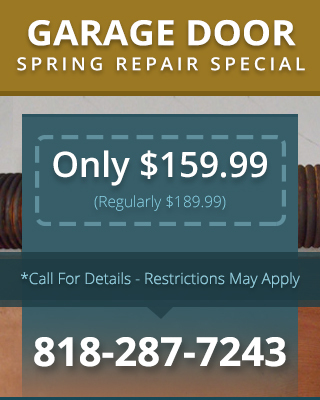 Limiting the damage and inconvenience caused by loose, worn, or damaged parts is as easy as getting garage door maintenance Granada Hills CA from a qualified professional. Our friendly, expert technicians know exactly what to look for in an inspection and they can quickly and effectively provide the maintenance you need. Having a functional garage door isn’t good enough. You also need to have a safe garage door. We urge you to be proactive in caring for your doors and invest in preventative maintenance. That way, you can rest assured that the safety features on your garage door are always in good working condition and will actually be able to protect you, your pets, or your kids from accidentally getting trapped beneath the door. Photo eye sensors, auto limit features, reversing mechanisms, and other safety measures are no mystery to our skilled technicians. We can identify any problems with these safety features and provide an honest opinion as to whether they can be repaired or need to be replaced entirely.